I’m going to spoil a lot of Bioshock Infinite for all of you, so beware this blog post if you’re planning on playing this game. Bioshock Infinite is a game about a lot of things. Religious zealotry, American Exceptionalism, theories of space-time and interdimensionality, patriotic jingoism, the inevitability of economic disparity, Occupy Wall Street, colonialism, and problems faced by political radicalism. While few of these plot threads arrive at a productive conclusion, it piques interest, causes uncanny discomfort, and provokes conversation and interpretation within its colorful fan community. However, my view on the meaning of Bioshock Infinite, which has conflicted with the interpretations of the many friends that I have discussed the game with, involves a subtle level of self-reflexivity that I saw pervading the game’s entirety. Bioshock Infinite is about the nature of narrative in games and the conflicts between emergent and fixed narrative, returning to the conflicts between ludology and narratology that had died down years ago. Before we begin, let’s go over some key terms necessary to understanding this argument, not everyone is a game designer. Emergent narratives are unscripted stories that come out of a game’s play, they may include dramatic character arcs in The Sims, and alternate histories created by Civilization V matches. Fixed narratives are stories determined by the game designer, and are most prominent in single-player narrative games such as Bioshock Infinite. Single-player games like Jak and Daxter are comprised of both fixed and emergent narrative elements. Fixed narrative in these games amounts to preset moments that occur between or during moments of gameplay, and may manifest themselves as cutscenes, background chatter, or narration. Games like these are also comprised of emergent scenes, which can vary wildly depending on player choice. Game narrative is not entirely dictated by the author, and exists as a strange amalgam of both embedded and emergent narrative. Game writers do not have complete control over how a game’s story will play out due to the nature of interactivity and player behavior. Even a single-player narrative game like Half-Life 2 can have an infinite number of narrative permutations dependent on how players approach combat and exploration sequences. Which is a topic Bioshock Infinite addresses in its brilliant, mind-bending ending. Booker and Elizabeth escape Columbia through an interdimensional portal into the Sea of Lighthouses, a mysterious world beyond the constraints of time and space where every possible permutation of the universe at any possible time in history can be accessed through an infinite number of doors. “There are a million, million worlds. All different and all similar. Constants and variables. There’s always a lighthouse, there’s always a man, there’s always a city… Sometimes something’s different… yet… the same.” says Elizabeth. This scene is soaked with metacommentary about the distinction and conflicts between embedded and emergent narrative. Everyone who plays Bioshock Infinite will be telling a different story in their playthrough. Combat situations will play out differently depending on player strategies, Booker may or may not find all the collectible upgrades in Columbia, he may spend hours playing carnival games at the fair, he may ride the carousel in Soldier’s Field, and he may scour every trash can in Columbia for food. These are the “variables” that Elizabeth is talking about, the “million, million worlds” that are all different and the same, Bioshock Infinite‘s story is comprised of an infinite number of permutations coming out of the game’s emergent nature. And yet, the rich range of narrative permutations that come out of interactivity is mooted by authorial intent and traditional narrative. Bird or Cage, ride the carousel or ignore it, fight with guns or Vigors, Bioshock Infinite‘s overarching narrative will always play out the same way regardless of player choice. All this is reinforced by the game’s single ending. While many games try to make player choice meaningful by providing a variety of outcomes based on player’s participation in the story, Infinite mocks the idea by making players powerless over the progression and ultimate outcome of the game’s plot. These are “constants”, the elements of a game narrative that are “always the same”. 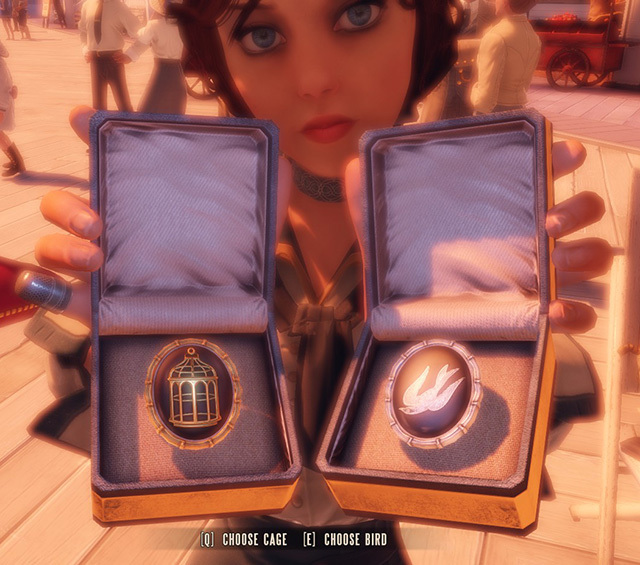 Bioshock Infinite is peppered with moments where players have to make a split-second binary choice, such as a decision to threaten or press a ticket seller, and the decision between two different brooches for Elizabeth. While most games like Mass Effect and Heavy Rain hinge upon these moments as an integral part of their branching storytelling, these moments in Bioshock Infinite make no meaningful difference to the overall outcome of the plot. Games are characterized by having quantifiable and variable outcomes, and player choice in gameplay dictates these outcomes, leading to meaningful play. Bioshock Infinite challenges the notion that binary choice is meaningful by making its choices meaningless, that is, if meaningful choice is to be defined as a choice that influences the game’s outcome. The first Bioshock had a rudimentary morality system where player’s choices in dealing with Little Sisters influenced the plot’s variable conclusion and marketed this system as an integral part of the game’s appeal. Infinite subverts player expectations by making these “moral choice” moments irrelevant to the outcome of the campaign, at most, leading to a minor cosmetic difference on a character or two. The artificiality and insignificance of these moments reinforces the notion that Bioshock Infinite is about the conflicts between player-generated and designer-dictated narrative and the diametrical opposition between ludology and narratology. Players are led by prior experiences with similar games to think that these binary choices matter with respect to the game’s narrative, and by subverting these expectations by making these choices almost irrelevant to the game’s conclusion, Bioshock Infinite raises questions about whether or not truly meaningful choice can really exist within a designer-driven narrative. Does Autonomy Exist in Narrative Games? The Lutece “twins”, the memorable and quirky duo of scientists lost everywhere in spacetime, provide perhaps the most thought provoking insight on game narrative in Bioshock Infinite. The Luteces are fourth-dimensional beings, and simultaneously exist in all places, at all times, in every possible universe. Adam Sessler of the fantastic Rev3Games channel likened them to Rosencrantz and Guildenstern for their self-referential nature on the nature of fate and free will. This is fitting given their role in the game’s narrative. Tom Stoppard’s play Rosencrantz and Guildenstern are Dead retells the story of Hamlet from the perspective of minor characters. The play deals with whether or not free will can exist within the world of a play, amongst other meta-things. The titular characters, doomed to die in the original Shakespeare play, attempt to defy their fate by escaping to England in one scene, but are rendered incapable of doing so by virtue of existing in a world dictated by an omniscient, godlike playwright. Video games are said to break from this problem by having the player enact the narrative by assuming the role of a character, thereby imposing free will into a universe traditionally thought to be dictated by an author. Bioshock Infinite challenges this idea in an early scene. Upon arriving in Columbia, Booker encounters the twins blocking a doorway. They walk up to him and give him a coin, “heads, or tails”, they ask. Booker flips it, calling heads, and it lands on heads, like it did for the last 122 times. In Rosencrantz and Guildenstern, a similar scene occurs where a coin lands on heads 92 times in a row. This leads the characters to wonder if they are under the control of a supernatural force. In real life, coin flips are determined entirely by random chance, and exist as a fair and impartial way of making binary decisions. This cannot exist within the constraints of a work of fiction, even computers at a machine level are incapable of simulating randomness. 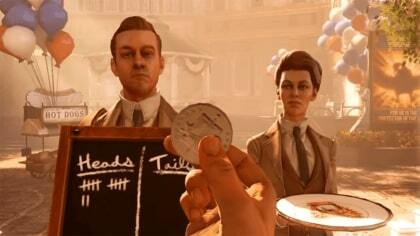 The coin-flip scene in Bioshock Infinite is not determined by random chance, and is scripted by the developers to always land on heads. What this means is that autonomy and procedurally generated narrative cannot exist within a narrative game like Bioshock Infinite no matter how hard developers attempt to give the illusion of an open-ended narrative. The coin-flip scene represented an ideal point to give the player the decision of calling heads or tails, but Booker is scripted to always call heads. This is done purposefully, as removing player autonomy from this scene tells us it is impossible for a game with scripted elements to be truly player-driven. 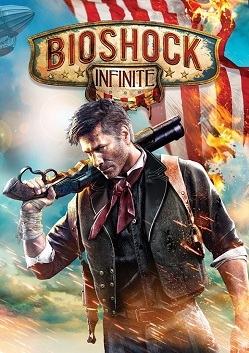 This notion of the impossibility of autonomy in single-player narrative games is reinforced immediately after the player regains control over Booker. The Luteces walk to the side and open the doorway for Booker to proceed and stand there. If the player stays near them, Rosalind will tell the player to leave several times before saying “If you don’t go, I’ll be forced to start repeating myself.”, after which, she does. This interactive scene is a prod at the artificiality of NPC’s in video games, and despite attempts at creating rich and realistic characters in fiction, characters are ultimately fictional constructs created by authors devoid of autonomy and drive. Lutece is scripted to repeat the same limited number of prerecorded lines until the player inevitably leaves the area and continues the game. Despite the fact that players regain control Booker in this scene, it is impossible for players to do anything but proceed down Infinite‘s narrative path. 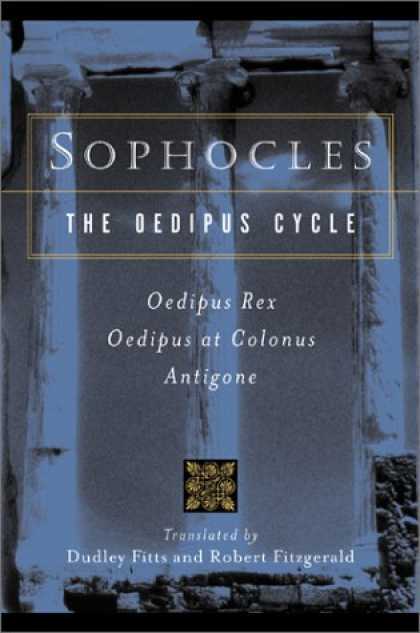 Look past Freudian interpretations, and this play has interesting things to say on free will. 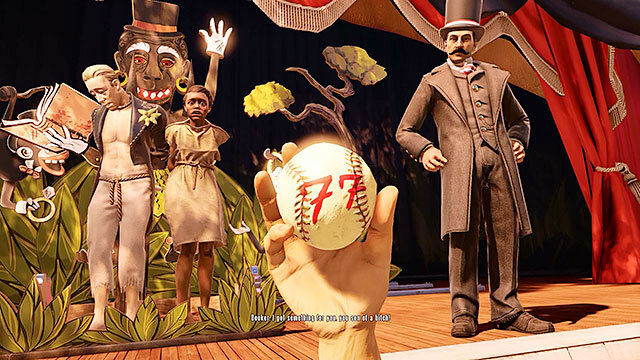 Bioshock Infinite‘s themes of the illusion of free will extend from the artificiality of NPCs to the very nature of interactivity later on in the game. In the game’s final sequence, Booker finds himself reliving the moment he sold his daughter to repay his debt. Booker tries to resist, and players, disgusted at this grim realization, will too. “You can wait as long as you want, eventually you’re going to give him what he wants. You don’t leave this room until you do.” says Elizabeth. At this point, the only option available to the player is to pick up the baby and hand it over to the man at the door, players cannot fight back or escape the room. Players will inevitably surrender the baby, since they cannot progress until they do. Both Booker, and the player, are rendered incapable of making any other decision by the very nature of Bioshock Infinite‘s method of storytelling. Aside from surrendering the baby after waiting for an indefinite time, the only other option available to the player is to quit the game. So is Booker an autonomous being, or is he controlled by an omniscient force called the Player? Perhaps the question being raised here is whether players are autonomous beings or simply actors controlled by the invisible hand of game design. The interactive nature of the medium would suggest that players are truly autonomous and capable of making rational decisions that influence the world of the game, but all this is an illusion. It is impossible for true, meaningful autonomy to exist in a single-player narrative game because the authored nature of fiction prohibits players from making choices outside of the ones that a game’s system allows. Its totally possible that I’m reading way too deep into Bioshock Infinite. However, even if my interpretation of the game strays far from predominant interpretations of Infinite, the questions raised by multiverse theory, the illusion of meaningful choice, and the myth of autonomy in single-player games raises interesting questions about the nature of video game storytelling. Just like how Rosencrantz and Guildenstern raises questions about the nature of fictional worlds dictated by authors, Bioshock Infinite raises questions about universes collaboratively authored by both designers and players. Good observations about Infinite’s commentary on collaborative narratives and the eventual futility of such decisions. I think the very fact that it embraced the multiverse theory in the manner it did helped avoid the outrage over its ending akin to the one ME3 had last year — one where player is funnelled through narrow choices no matter how different their experiences maybe. Just one correction to what you said. In the pivotal coin-flip scene, Booker randomly calls either Heads or Tails. Yet the outcome is the same. I believe it simply means that the player’s universe is one of the infinite ones but under very strict circumstances. In the entire journey, we are linked to Booker just like Elizabeth is. So when the various Elizabeths disappear one by one upto where our Elizabeth is the only one left, the screen blacks out at the same time, signaling perhaps the “end” of player’s role. This decision among few others(like killing Comstock or decisions where you have no other option than to choose them in order to progress) are taken out of players’ hands to pander to the author’s will while the decisions we do get to make matter next to nothing in grand scheme of things. Perhaps, it either critiques how all stories which offer choice only envelope players in its illusion. Or it perhaps indicates the inevitability of fate. I have heard anecdotal evidence to the effect that Booker actually does call tails on the coin toss in some playthroughs of the game — which of course has no effect on the outcome. Additionally, word has it that there are several other minor details, unrelated to player choice, which may change; the example I was given is that the appearance of the self-proclaimed “progressive” who shelters Booker in his house may be different — one group of players may see him as young, blonde, and clean-shaven, while for another group he turns out to be dark-haired, bearded, and slightly older. These are all, again, MINOR details (what the Luteces would call “variables” as opposed to “constants”); as with the choices the player is permitted to make, they have no bearing on the main arc of the plot. To me, it feels rather like the game designers are sneaking in even more permutations of the main plot (I say “sneaking” since you have to play the game multiple times even to notice it) just to reinforce the idea that the variables don’t matter. Bioshock Infinite includes a lot of things! I don’t know if this is a good for video gaming industry.How do you know if it contains too many things? Hi, i don’t play videogames, but love them all the same! I haven’t played the game yet but I think in general we’re seeing a generation of such games which blend novel-style story telling – with all the commerntaries, themes, satire, wit and the rest – with game playing. It’s light years ahead of the old shoot-em-ups of the Doom era, and in many ways it was pioneered by Valve with their original Half Life. I think it’s likely the way of the future, and as programming and computers become more capable, we’ll likely see more down this direction. An interesting development – and one that makes these games more, I think, than just entertainment; they provoke and make us think – like novels. Love the game. Interesting storyline, don’t worry I won’t give spoilers 🙂 but I agree with this post wholeheartedly. Well done on a good article. As an individual who has managed to play every Bioshock up-to-date, I find your commentary and evidence to be compelling. At the same token, considering this entry is a stand alone entry into the series, I believe it is important to draft a follow up post emphasizing the social commentary that was consistent through the first two games. It’s just a suggestion but I firmly believe to talk on the merit of this, there should be credit to its predecessors, which by far, was better in its navigation of crafting backstory of a Utopian-esque world. And it’s ultimate failure due to the human nature. You’re not reading too much into it, I’m positive much of the game is a commentary on the narrative nature of video games. In the sea of lighthouses, for just a moment I hoped the other Bookers you saw were actual other players (Dark Souls style). I do wonder which came first: is it a story about fate in parallel universes using video games as a metaphor, or the other way around? Reblogged this on A Random Encounter. Great analysis! I never thought of it as a commentary on the video game industry itself. I only saw it as a continuation of the themes of Bioshock (“A man chooses, a slave obeys”) and Bioshock 2 (Delta’s new free will but his lack of choice as he must find Eleanor or die; as well as the impression his choices leave on Eleanor). As I played Bioshock Infinite I kept debating what effect or symbolism choices such as the bird vs. cage necklace would have on the ending, as I had been conditioned by the rest of the series. Joke was on me, and I’m sure my other Bioshock players, when we discovered the finality and singularity of the the ending. Now that they’ve opened the universe up to infinite possible variations on Columbia and Rapture, do you think they will or should continue the series in that vein? I see the game less as a commentary on the industry and more as a analysis of the form itself. I’d like to see the series continue, in its flaws, this is one of the more interesting AAA franchises out there and there’s a lot of great thematic content to cover. I would suggest checking out the Half Life 2 mod The Stanley Parable. It is about many of the topics you mentioned in this article.